In the following, we inform you about the type, scope, and purposes of the collection and use of personal data. You can access this information at any time on our website, wordcounter.net. 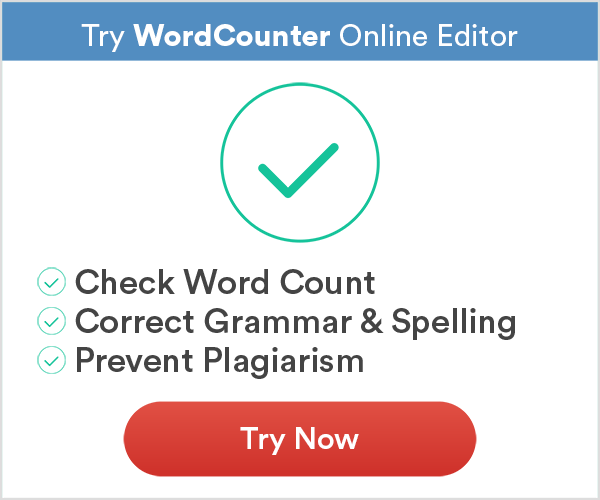 Please feel free to address any questions or concerns regarding data protection or privacy to privacy(at)wordcounter.net. This data is stored for purely technical reasons and is never associated with any particular individual. The data about website access is used for error analysis, ensuring the security of the systems, logging of access to services (Word Counter), and to improve our service. If you use our word counter, you transfer to our servers all texts you would like to check. This is required for us to perform the check and to provide you with service. Please note that you may not use our free service for any texts containing personal data of any kind. First name, last name, or both. Since this is a free service there’s no guarantee in terms of uptime, quality, or reliabilty of service. Cookie to store your most recent text, so if you accidentally or purposely exit our website, and then come back, your text and modifcations won’t be lost. We can’t guarantee your text and modifications will still be present since we have no control over your computer and you might have deleted or blocked this cookie mentioned in the mean time. I have to say, after using this site for all my life, I do feel someone needs to give some appreciation. I want to personally thank you for making school so much easier with this website. I do have one idea for you though. With all the teens, like myself, using iPads and such for school, an app for this website would be an amazing thing to happen. Once again, thank you for all you do and for making my life a little bit easier in all the bustle.